WATERFRONT pool home with BAY & GULF ACCESS! 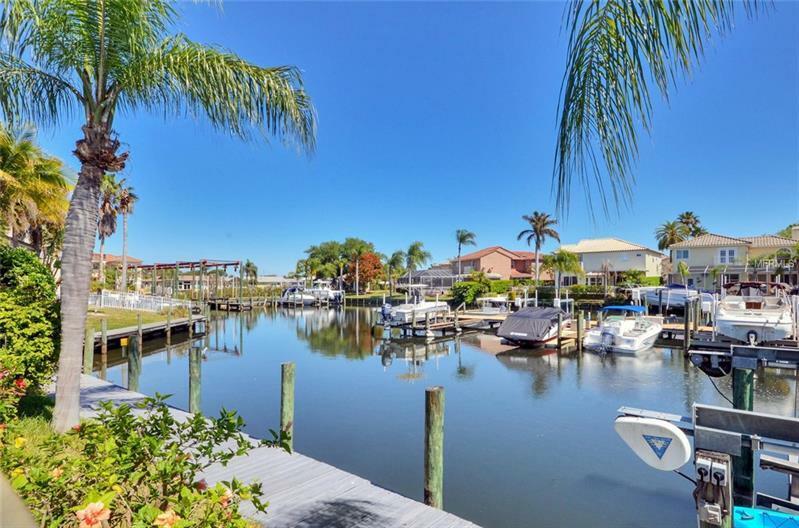 You will not want to miss seeing this lovely home located on the MARINA in the GATED community of Palm Bay. One of the best locations in the community right on the end of the CUL DE SAC with no immediate neighbor on one side. As soon as you arrive, you will notice the nice curb appeal of this home & beautiful STAINED GLASS DOUBLE DOORS as you enter. SOARING ceilings & an OPEN FLOOR PLAN greet you along w/ WATER VIEWS galore. The living & family rooms flow into the outside pool & marina area through sliding glass doors, making for a great entertainment flow. The kitchen is open to the family room w/ a breakfast bar & has BRAND NEW GRANITE COUNTER TOPS, w/solid wood & decorative glass front cabinets. The formal dining room is just off the kitchen, as well as the laundry room, & door to the SIDE LOAD 2 CAR GARAGE. Upstairs you will find the spacious master bedroom en-suite with WATER VIEWS, 2 WALK IN CLOSETS, and UPDATED bath with DOUBLE VANITY BOWL SINKS, GRANITE COUNTER TOPS, garden tub and separate shower stall. BRAND NEW LAMINATE FLOORING IN MASTER & ONE OF THE GUEST BEDROOMS. Now for the outside! Great backyard/pool area w/ access to a POOL BATH & is completely FENCED & LANDSCAPED overlooking the marina. Just walk out to the dock & your own DEEDED BOAT SLIP W/ LIFT & head on out to the bay for some fishing or a sunset cruise. EXCELLENT LOCATION, GREAT SCHOOLS, only 5 min to Berkeley Prep, 10-15 mins to airport & 30 mins to beaches! Active fun neighborhood!